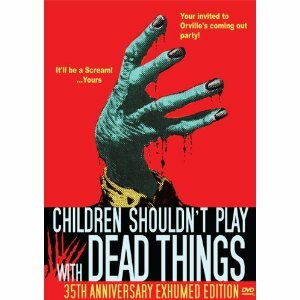 There’s really no better way to title a blog post about the 1973 movie Children Shouldn’t Play With Dead Things. Probably one of the best horror movie titles ever. And it’s by Bob Clark, who went on to direct Black Christmas, the Porky’s movies, and even A Christmas Story! The first time I saw this zombie flick years ago, I remember being very bored. At some point, I watched it again and realized the slow first hour is made up for by a final 25 zombie-licious minutes. And even the first hour has classic eerie ambience including fog, dark lighting, a graveyard, and “killer” POV. Watching it yet again, I now determined that this is possibly one of the first horror movies to have a bunch of stereotypical kids acting really stupid and just asking to be devoured by zombies. Despite the ridiculous Brady Bunch clothes they all wear, their performances and dialogue could be from any modern day straight-to-DVD horror flick. The plot is simple. 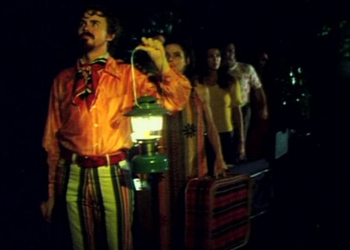 A bunch of actor friends goes to a deserted island to stay in a cottage—and exhume a body from a graveyard. There’s an old spell book, they read from it, the dead come back to life. Evil Dead much? What stood out most to me is that this film from 1973 has not one, but TWO gay characters. Sure they are both quite queeny so that the audience gets the message, but they’re just part of the gang. Nevertheless, they’re still the first to get their asses eaten. Let me rephrase that. They’re the first to get attacked by zombies. Got this movie mixed up with another film I have called Men Shouldn’t Play with Hard Things. Love that movie. The film may seem like a paint (with blood) by numbers clone of Night of the Living Dead, with the gang boarding themselves up in the cottage while zombies break through windows and doors. However, the new addition of the zombies crawling from the ground makes me think this film is the inspiration for every zombie movie (and Michael Jackson’s Thriller video) that came after it. It also has one of the most effective slow motion endings EVER. Creepy! This entry was posted in Johnny You ARE Queer - Gay Thoughts, Movie Times & Television Schedules - Staying Entertained, The Evil of the Thriller - Everything Horror and tagged Children Shouldn’t Play With Dead Things, gay horror, living dead, undead, Zombies. Bookmark the permalink. I’ve always loved this movie! 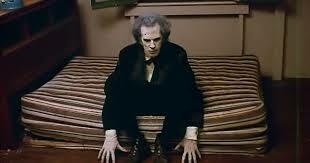 I remember seeing it when I was kid, late at night, up after bedtime, all by myself in the dark. It had a lasting effect.